Tripawd or “bi-pawd”, we love celebrating the stories of inspirational animals from around the globe. 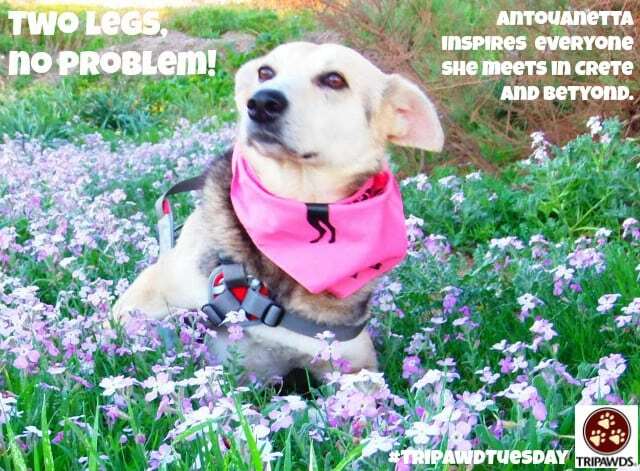 That’s why today’s Tripawd Tuesday shines a light on Antouanetta, a beautiful large two-legged dog from Greece. We know you’ll love getting to know her! She’s a big two-legged dog who rules the pack. She was found run over by a car as a puppy about 10 years ago, in the town Giannitsa of north Greece. She was rescued by the Giannitsa animal welfare society. She was lying helpless for a couple of days near the side of the road before anyone attended to her assistance and as a result the wounds on her hind legs got infected all the way up to her pelvis and the vets back then decided to amputate them both in order to save her from septicemia. With zero adoption potential she spent the first 5 years of her life in a kennel at the local animal welfare society that rescued her. That was until 2012 when she was finally adopted by a dog-trainer from Athens. Tragically her new owner died in a car crash a few months later. The trainer’s brother who got custody of Andie put up a notice for adoption for her on facebook with a 3 week adoption deadline before euthanasia. 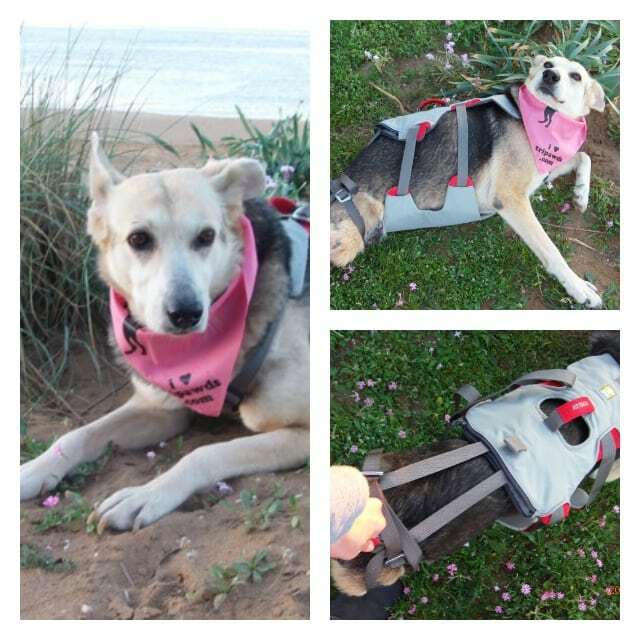 She gets around with help and the Ruffwear Doubleback harness. That’s when I came across her facebook album in December 2012 and I got in touch with the family in order to cancel the euthanasia and get some extension time to make plans for her adoption. I adopted her officially on January 17th 2013 (Saint Antony’s day), and that’s where she got her name from. Since then and for the last 4 and a half years I’m doing my best to make sure she lives the life of a Queen along with her 7 bros and sisters. As a compensation to her very unfortunate earlier days. She is a local celebrity in the town of Chania where we live in Crete. She has been hosted on local TV news, numerous blogs, newspapers, and last year she won the Greek Dog of the year award. (2nd place out of 2500 entries). I would describe her as a wise dog, with an attitude of superiority. 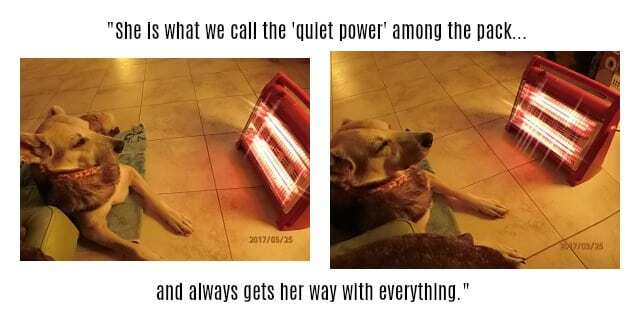 She is what we call the “quiet power” among the pack, and always gets her way with everything. 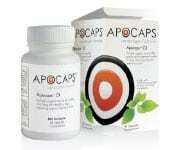 Antouanetta keeps slim and takes joint supplements to stay strong. She has a “thing” about recycling. She enjoys moving all the tins and carton boxes from the recycling bin to her bed late in the night. But no plastics. She has been doing this since the first day I took her home. Maybe a habit she had from her stray puppy days. She enjoys walks on the beach every weekend, and also loves to fry herself under the sun throughout spring and summer. I hope she will be with me for many more years to come. We Want Your Tripawd Tuesday Story! Thank you for sharing this lovely story about this delightful pup and her kind, very kind human. 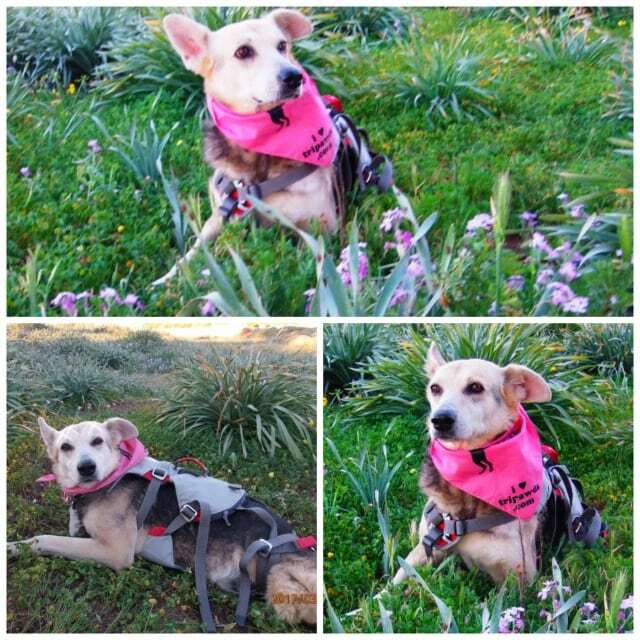 Antoouanetta is auch an inspiration, a true survivor and a great recycling expert Such a beautiful dog…inside and out!